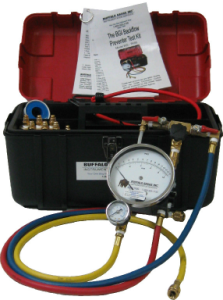 Serving the Backflow Industry with Prevention Test Kit for more than 40 Years | Buffalo BackFlow, Inc. Serving The Backflow Industry For More Than 40 Years! 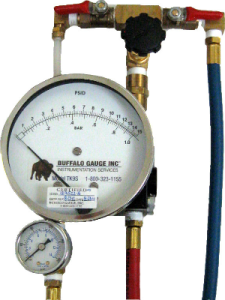 The Buffalo Backflow BGI-TK9S Backflow Prevention Test Kit is a compact portable testing device made for testing all reduced pressure zone backflow prevention assemblies, double check, and PVB valve assemblies. Buffalo Backflow Prevention Test Kits are ready to use right out of the box, with a NIST traceable certification, rugged foam-lined carrying case, and adapters. When you purchase a Buffalo Backflow Test Kit, you are entered into our database that automatically sends you a reminder 60 days in advance of your calibration and certification date. This gives you plenty of time to get the kit in for calibration, and keeps you in compliance with State and local regulations.